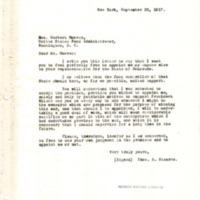 Thomas B. Stearns tells Herbert Hoover that he is willing to serve as food controller for Colorado provided Hoover feels comfortable in nominating him. I do believe that the food controller of that State should have, as far as possible, united support. You will understand that I was actuated to accept the position, provided you wished to appoint me, solely and only by patriotic motives to support President Wilson and you in every way to add whatever I might to the measures which are proposed for the purpose of winning this war, and that should I be appointed, I will be undertaking a good deal of work, which will mean considerable sacrifice on my part in view of the enterprises which I had undertaken previous to the war, and which it is necessary that I should supervise for a long time in the future. Please, tgherefore, insofar as I am concerned, be free to use your own judgment in the premises and to appoint me or not. Stearns, Thomas B., “Thomas B. Stearns to Herbert Hoover,” 1917 September 22, WWP19197, Hoover Institute at Stanford University Collection, Woodrow Wilson Presidential Library & Museum, Staunton, Virginia.